BAE 500C FET Compressor Module features a FET gain reduction and a feedback style peak limiter. Inside the BAE 500C you will find three 2520 style opamps, which are packed full of character. The BAE 500C has premium components and a classic circuit design which adds highly desirable analogue warmth to your signal! These key features make the 500C an all-star compressor for everything from drums to bass to vocals. 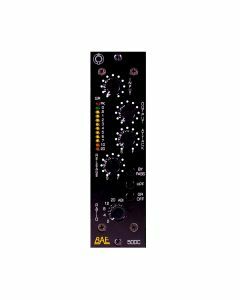 The BAE 500C is a 500 Series FET compressor based on the classic 1176. Based on the design of studio staple FET compressors of the ’60s and ’70s heard on countless hit records, the 500C features controls for input and output gain, plus the four selectable, time-honored compression rations of 4:1, 8:1, 12:1, and 20:1. In addition to taming peaks, its premium components and classic circuit design add highly desireable analog warmth to your signal, making it an all-star for everything from drums to bass to vocals. Like all BAE Audio gear, the 500C is hand-wired in California to ensure the highest possible quality control. Unlike the original, the BAE 500C also has a side-chain HPF which prevents excessive bass from triggering the compressor. The BAE 500C FET Compressor Module compressor is assembled in California US to match the exacting quality control associated with BAE Audio.